Members of the Arrested Development cast have reached out to apologize to Jessica Walter following a recent interview. Season 5 of the cult series is set to arrive in Netflix on May 29. Members of the cast recently gathered together for an in-depth interview with the New York Times. The interview turned ugly as Jeffrey Tambor, who was fired from Amazon's Transparent amidst misconduct allegations, was defended by Jason Bateman and Tony Hale. Bateman specifically was accused of being dismissive of Tambor's behavior, leading to Walter getting very upset and crying during the interview. 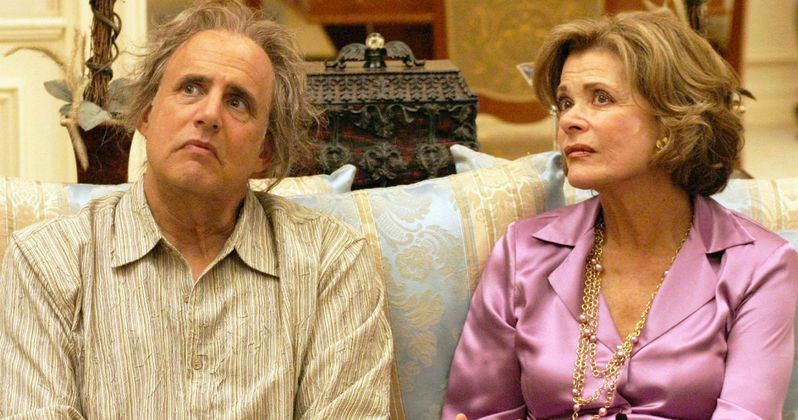 Jeffrey Tambor verbally assaulted Jessica Walter during the production of Arrested Development at one point. While the actor has denied any sexual misconduct allegations made against him, he has admitted to having a temper problem. Jason Bateman wrote this behavior off as typical for the industry. Alia Shawkat, the only other female cast member present for the interview, chimed in saying, "that doesn't mean it's acceptable. And the point is that things are changing, and people need to respect each other differently." Bateman's behavior during the interview has been called out by many online and clearly upset Walter to a strong degree. In a series of posts on Twitter, Bateman apologized to his co-star. "Based on listening to the NYT interview and hearing people's thoughts online, I realize that I was wrong here. I sound like I'm condoning yelling at work. I do not. It sounds like I'm excusing Jeffery. I do not. It sounds like I'm insensitive to Jessica. I am not. In fact, I'm horrified that I wasn't more aware of how this incident affected her. I was so eager to let Jeffrey know that he was supported in his attempt to learn, grow and apologize that I completely underestimated the feelings of the victim, another person I deeply love, and she was sitting right there! I'm incredibly embarrassed and deeply sorry to have done that to Jessica. This is a big learning moment for me. I shouldn't have tried so hard to mansplain, or fix a fight, or make everything okay. I should've focused more on what the most important part of it all is there's never any excuse for abuse, in any form, from any gender. And, the victim's voice needs to be heard and respected. Period. I didn't say that and instead said a bunch of other stuff and not very well. I deeply, and sincerely, apologize." Jessica Walter during the interview said, "In like almost 60 years of working, I've never had anybody yell at me like that on a set. And it's hard to deal with, but I'm over it now." Tony Hale, who plays Walter's son Buster on Arrested Development, chimed in at one point saying, "I will say, to Jason's point, we can be honest about the fact that, and not to build a thing, we've all had moments." Walter replied saying, "Not like that." Hale also took to Twitter to reveal that he has reached out to his co-star to apologize and admitted that he feels he minimized her pain. "I have reached out to Jessica personally to apologize. Arrested Development is one of my families. Regardless of my intentions, it is clear that my words, both said and unsaid, served to minimize Jessica's pain and for that I am extremely sorry." The full group for the interview included Jason Bateman, Jeffrey Tambor, Jessica Walter, Alia Shawkat, Will Arnett and Tony Hale. Many industry professionals have criticized Bateman's behavior, with Cosmopolitan's Kaitlin Meza saying, "I had to stop reading after the ninth time Jason Bateman interrupted a crying 77-year-old woman to say that she was over-reacting to what an entire room of people agreed was abuse." This interview will no doubt cast a shadow over the release of Arrested Development season 5. You can read the full interview with the cast over at The New York Times. one small but very striking thing from that nyt arrested development interview: jason bateman essentially explaining "how the industry works" to jessica walter, as if she isn't an accomplished veteran of the same industry.